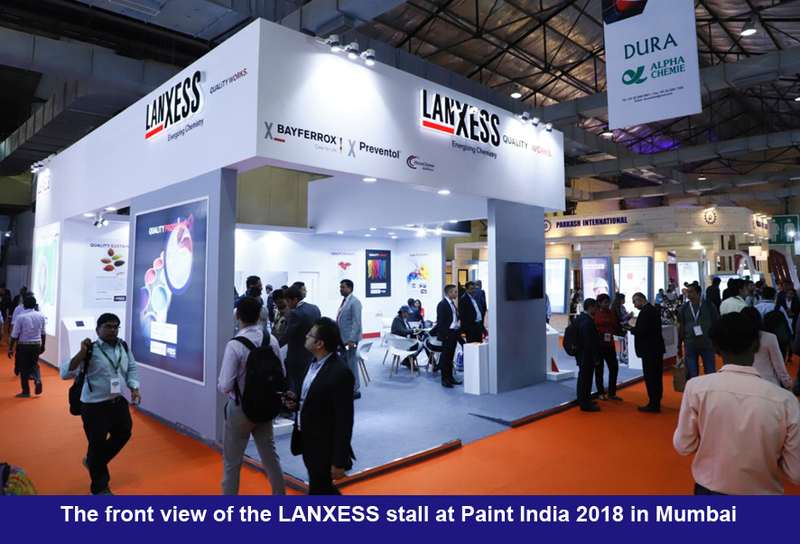 The German-based specialty chemicals company, LANXESS was presented its comprehensive product portfolio for the paint and coatings industry at the exhibition Paint India 2018 from March 8 to 10, 2018 at Bombay Exhibition Centre, Goregaon, Mumbai. The products showcased include the high-performance pigments from the lightfast, weather-stable and chemical-resistant Bayferrox® and Colortherm® lines, the organic and inorganic pigment preparations Levanyl® and Levanox® and the extensive Preventol® and Biox® range of biocides. At the exhibition, LANXESS showcased the whole color range of iron oxide and chromium oxide pigments, and exhibited its sustainable, innovative solutions. The products of the Inorganic Pigments business unit (IPG) – marketed under the well-known brand names Bayferrox® and Colortherm® – cater to the paint and coatings, construction plastics and paper industries. The paint and coatings market is very important for LANXESS as it is one of the fastest growing applications for the company’s specialty products. The ongoing urbanization in India creates a growing demand for the coatings industry. High-quality pigments from LANXESS’ Inorganic Pigments business unit offer not only outstanding light fastness, high tinting strength, color consistency and weather stability but also an unmatched dispersibility. IPG is introducing its new product range of red iron oxide pigments. The new grades, Bayferrox® 510, Bayferrox TP 5278 and Bayferrox TP 5279, satisfy demand for more yellow-shade red pigments. At the same time, they are produced by the Ningbo process, a uniquely sustainable manufacturing method based on patented technology, that meets the most stringent environmental standards. Performance-wise, the new red grades meet the high standards of the well-known Bayferrox® brand and provide unique benefits for paints and coatings producers. Some of those product characteristics include high chromaticity and tinting strength; good optical appearance with respect to gloss and haze; and optimized milling parameters for easy dispersibility even at low shear energy input. Additionally, the Ningbo process significantly reduces the residual, water-soluble salt content of the pigments, making them suitable for corrosion-resistant coatings. The LANXESS RheinChemie business unit is presenting its products Levanyl® and Levanox®. Levanyl® products are aqueous, solvent-free organic pigments which are lightfast, and possess high brilliance and noted above all for their fine dispersion and high transparency. Whereas Levanox® is a family of aqueous, solvent-free inorganic pigment preparations, comprising selected high-grade inorganic pigments, which can be used in paints & coatings and detergents. Rapid industrialization, economic activity and rising demand from urbanization especially the construction applications are driving demand for paints and coatings. As one of the leading manufacturers of biocidal active ingredients and biocide formulations, the LANXESS Material Protection Products business unit (MPP) offers a comprehensive range of products for the paints and coatings industry. Along with outstanding technical service, the LANXESS Preventol® biocides for coatings fulfill the key demands placed on such products: low toxicity, non-VOC (volatile organic compounds), non-FA, cost-effectiveness and compatibility with other components of the coating. These products do not only preserve the good appearance of facades or patios, for example, but also safeguard the value of these objects in the long term.